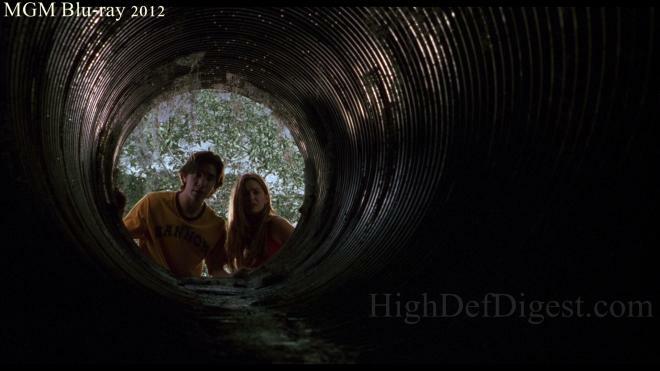 On a desolate country highway, two homeward-bound teens (Gina Philips, The Sickhouse and Justin Long, Drag Me To Hell) are nearly run off the road by a maniac in a beat-up truck... and later spot him shoving what appears to be a body down a sewer pipe. But when they stop to investigate, they discover that the grisly reality at the bottom of that pipe is far worse than they could have ever suspected... and that they are now the targets of an evil far more unspeakable – and unstoppable – than they could have ever imagined! 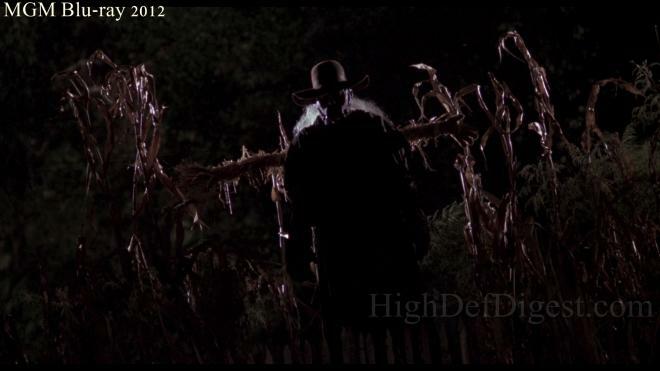 'Jeepers Creepers' is one of those sad cases where the movie starts off strong and quite effective but quickly devolves into formulaic drivel because the filmmakers can't figure what to do with their otherwise terrific premise. Eleven years since its release — which is more of a frightful thought than the movie itself (Where did the time go?) — the story's most memorable aspect is the suspenseful mystery at the beginning, and its remains so, just as creepy and scary as ever. But as it drags along into the second half, made worse by Justin Long's terrible performance and a dreadfully weak third act, we're soon reminded of the film's flaws and why it's ultimately another forgettable genre entry. From producer Francis Ford Coppola, the film is actually two stories in one, a sudden shift in tone and plot that occurs awkwardly at the midway point. The first half follows siblings, Darry (Long) and Trish (Gina Philips), driving though the lonely Florida countryside on their way home for Spring Break. Why they decided to miss out on traditional college debauchery in The Sunshine State is not entirely clear and becomes a bit of a mystery. Nevertheless, there's an amusing, lighthearted rapport between the two that's believable and soon ratchets up the chilling fun when they share an urban legend associated with the road they're on. Even as the pair stupidly decide to investigate the large pipe, the entire first half is a frighteningly suspenseful ride of two kids trying to survive a maniac's bloodlust. And to this day, the image of the truck barreling down the road and of its creepy driver standing alone at a church remain ingrained in memory. Then, it starts going downhill when it's revealed what he actually is. Much the same way Philips's character handles and pretty much ruins the transmission on a beautiful 1960 Chevy Impala, writer and director Victor Salva changes gears from a road thriller with a classic-horror overtone to a supernatural slasher flick with aspirations of a creature-feature. It's loud and grating to the ears as well as the imagination, and discovering the driver is some kind of demon or devil that feeds every twenty-three years cheapens the experience of everything that preceded it. There's something more unnerving and spine-chilling in thinking the killer was human. Not so much as an immortal being that can't be killed, an abrupt and rough downshift from scary urban legend to fantasy silliness. By the time we finally arrive at the third act inside a police station, we're left wondering where the disturbing atmosphere disappeared to, not whether the siblings will survive their pursuer. Or that we even care if either of them does. And Patricia Belcher also shows up out of nowhere as the hysterical psychic Jezelle, reiterating everything we already knew about the creature when piecing the first half with everything that followed. Admittedly, Salva does set up Belcher's character somewhat via a phone call, but her presence nonetheless feels sloppy and rather superfluous. In fact, other than providing some minor exposition on The Creeper's eating habits, Jezelle is ultimately pointless, adding nothing of great value to the predictable finish. 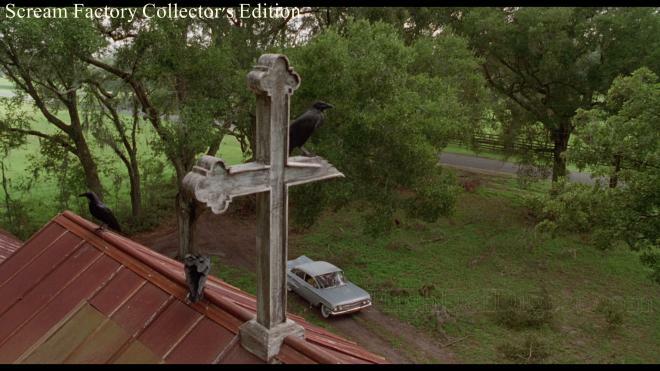 It may seem as though I despise 'Jeepers Creepers' when pointing out its flaws, but I actually rather enjoy it as a mildly amusing horror movie with a bizarre sense of humor about itself, especially because of the exceptionally well-done first half. It wouldn't feel so awkward if only the transition from road thriller to supernatural slasher were somehow smoother. But as it stands, it's an entertaining flick with some severe engine problems that can't be avoided until it's too late and it suddenly breaks down in the middle of nowhere. Salva could have saved himself the trouble by having an experienced mechanic look under the hood rather than trying to do the work himself. Shout! 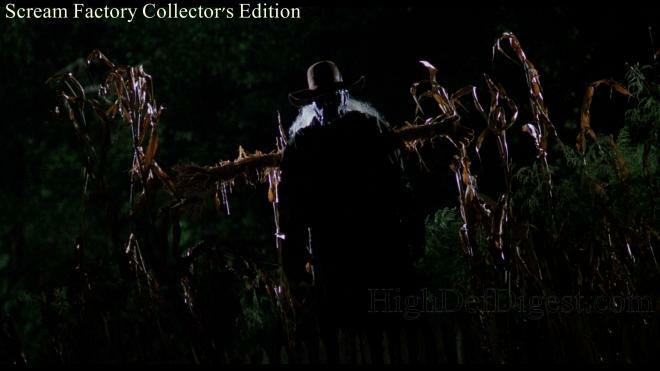 Factory brings 'Jeepers Creepers' to Blu-ray as a two-disc Collector's Edition package under the distributor's Scream Factory line. The two Region A locked, BD50 discs are housed inside a normal blue case on opposing panels with brand new reversible cover art and a cardboard slipcover. The second disc contains a wealth a new bonus features that should make fans very happy. The Creeper comes thundering and barreling down the desolate highway with a strong and very satisfying 1080p/AVC MPEG-4 encode that unfortunately doesn't offer a massive jump over the 2012 MGM release. 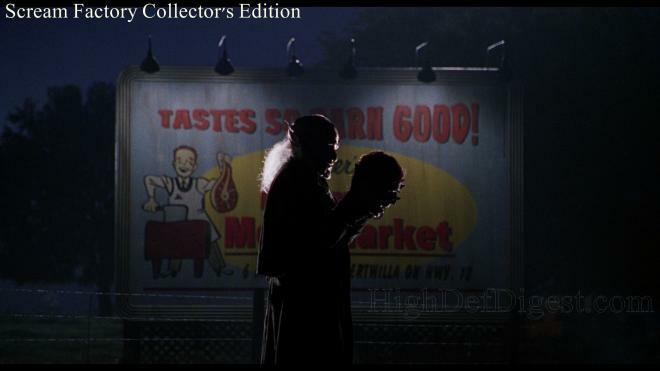 To be fair, there are plenty of visible differences between the two worth admiring and mentioning, giving this Scream Factory edition the clear edge, but for all intents and purposes, this 2K remaster of the interpositive isn't the significant night-and-day version fans were initially hoping for. This high-def transfer shows many of the same soft, flat spots mixed with a few other poorly-resolved sequences, and a tad of crush is also visible during several darker moments. 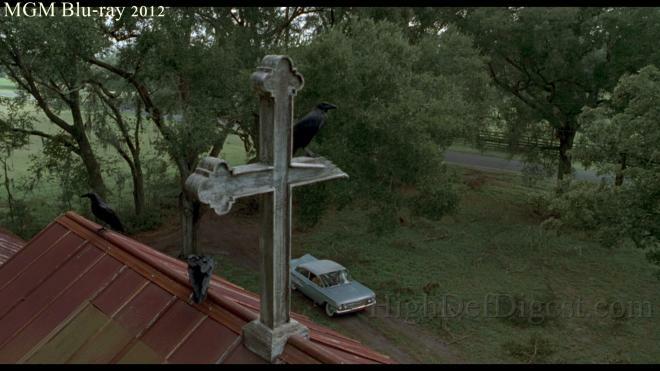 There not so terrible as to distract from the film's enjoyment, but they're there nonetheless and in the same moments. There also seems to have been an effort in correcting the somewhat dull and drained look of the first release by slightly boosting the contrast. For the most part, this makes for a more pleasing presentation, but the shift is noticeable when clouds lack distinction and the sky suddenly changes from a bright blue to a dreary, grayish overcast. Black levels are thankfully not affected by the change, looking quite good and penetrating throughout. There are also minor, near negligible instances of noise reduction mildly applied, but the grain structure, on the whole, remains intact, giving the video an attractive film-like appearance. It would appear colors have also been corrected but occasionally tend to look a tad oversaturated and amplified in a couple spots. However, the overall quality of the palette is quite attractive and natural, giving the presentation a welcomed energetic appeal. Although not always consistent, the rest of 1.85:1 image displays excellent definition and sharp lines around The Creeper's truck, on nearby trees, or the surrounding tall grass while facial complexions are often revealing. 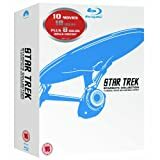 In the audio department, things appear to remain the same with Scream Factory essentially porting over the same DTS-HD Master Audio soundtrack as before, except that they add a stereo track as an alternative to the arguably better 5.1 surround sound option. In either case, my thoughts have not changed on its quality, so I'll repeat my comments from before. The front soundstage is wide and expansive with plenty of great off-screen effects that are convincing and crystal clear. Dialogue is fluid and intelligible with excellent channel separation that never overwhelms the conversations or the screams of terror. The mid-range is surprisingly extensive and detailed, never faltering during the several high-pitched squeals of The Creeper, the few frighteningly bombastic horn sounds of the truck or the many loud jump scares. Bass comes with a nice, deep response, providing a satisfying punch to the action sequences, though it doesn't dig very low or rattle any walls. Rear activity is not all that impressive, but discrete effects are employed on occasion to broaden the soundfield and participate in the scares. The musical score does a better job at sustaining a consistent presence, spreading into the back and filling the room with an air of dread and apprehension. Fans are sure to really get a kick out of this lossless mix. Audio Commentary — The first is the same with writer and director Victor Salva providing a pretty monotone but incredibly informative commentary track, filled with several anecdotes, technical details, shooting locations and the creative choices made on the spot. He candidly dissects and analyzes his own film with his best remarks being the influence of classic horror films. The second track is a new one with Salva being joined by stars Justin Long And Gina Philips. The reunion immediately kicks off with an affable and friendly tone, as the three seem as though they've remained friends since finishing the production. Although there are a couple pockets of silence sprinkled throughout, the conversation makes for a fun listen, filled with various anecdotes and memories from the set. Jeepers Creepers: Then And Now (HD, 37 min) — Essentially a collection of interviews with various members of the crew sharing their thought on the genre and production, but it's primarily focused on Salva. From Critters To Creepers (HD, 20 min) — Producer Barry Opper talks extensively about his career working with some legends of the genre and his eventual involvement with this production. The Town Psychic (HD, 17 min) — As would be guessed from the title, actress Patricia Belcher is given a few minutes on her character and overall impression of the end product. Behind the Peepers (HD, 60 min) — Although encoded in HD, this is the same standard-def six-part making-of doc from previous editions, taking fans deeper into the movie and revealing pretty much every aspect of the production imaginable. Made from a collection of cast & crew interviews, production stills, video clips and lots of BTS footage, the hour-long featurette starts on script origins and the development of the two main characters. After that, the doc goes through the usual motions of designing the creature, finding the perfect vehicles, the make-up effects and finally, the musical score. Deleted Scenes (HD, 17 min) — A decent collection of ten deleted and extended scenes, joined by alternate openings and endings. 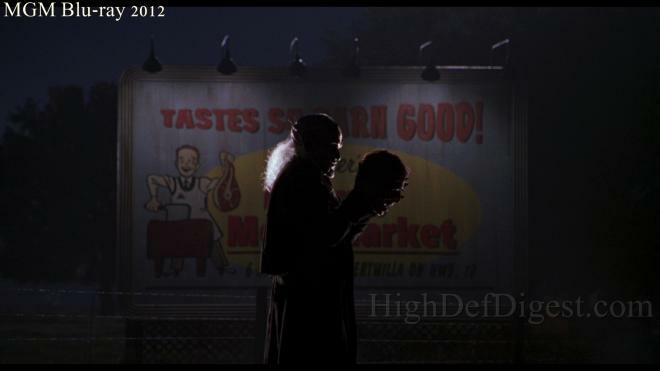 Trailers (HD) — The original theatrical preview is joined by a radio spot. Still Gallery (1080i/60) — An assortment of production stills, on-set photos and some design concepts while music from the film plays in the background. 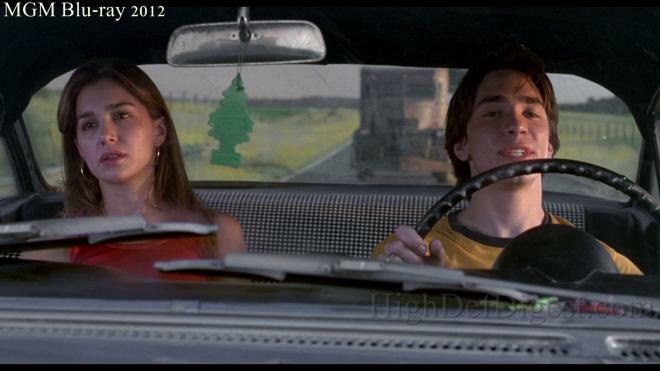 From producer Francis Ford Coppola, 'Jeepers Creepers' starts off with a suspenseful and terrifying blend of classic horror tropes with two siblings driving alone on a country road. Writer and director Victor Salva demonstrates a great deal of potential and talent, with a good sense of dark humor, but sadly fails to live up to promise of the film's opening with a dissatisfying second half and a horribly weak third act. The Blu-ray from Scream Factory arrives with a slightly improved picture quality but not by much while the audio presentation offers a spooky and fun atmosphere. The folks at Scream have a compiled a worthy set of supplements, making the overall package a must for devoted fans.